No one was more surprised than me when Ron phoned a broker about listing “Annwfn,” our Niagara 35. Yes, I had mentioned a couple (maybe a few?) times that a trawler might make more sense down south since we spend most of our winters motoring in the narrow ICW and we can count on one hand (and still have fingers left) the number of times we’ve had a good sail in the 4 winters we’ve spent boating the southern Florida coast. Ron began researching/searching for trawlers that might meet our “requirements”–he does love “projects!” We nearly bought a Bristol 38 which didn’t meet all our needs but was a good price and could be “fixed,” but basically failed its survey. Back to the drawing board. Ron began looking at tug trawlers. We decided a small tug trawler would be a good way to go. But they are expensive. Ron looked at one that needed lots of work in December and made a low-ball offer, but the owner turned us down. We went back to Florida for our winter aboard Thyme Hyssop & Wry, Ron still on the prowl for the “perfect trawler.” Although the Prairie 36 was larger than we thought we wanted at this point, Ron was impressed with the way they’re built. And best of all, they have almost no teak. We’ve had our “teak farm.” As pretty as the boats are, we don’t enjoy the work keeping them up. Ron took me to look at a Prairie 36 when we were back on the hard, tending to our keel leak in January. He had looked at it in December and thought it had possibilities. All I saw was a ton of work and unknown problems. We were back to square one. About halfway through our time at Fort Myers Beach this past winter, we walked over to Moss Marine to get dinghy fuel. At the marina was a familiar-looking trawler with Muskegon, MI port of call. For many years, we sailed out of Muskegon before moving our sailboat further north, closer to our summer cruising grounds. Ron walked out on the dock to check her out. Sure enough, she was a Prairie 36. The owners weren’t aboard so we planned to stop by at a later time to say “hi” and visit with them. Perhaps we even knew them. Turns out, they weren’t from Muskegon at all; they’re from upper New York state, having bought the boat from Muskegon 4 years ago and brought her through the North Channel, Trent Severn, and down the east coast. We were with our friends, Casey and Edyth from Bookworm, who traded their southern sailboat in for a trawler 2 years ago–likely we have them to blame for planting the seed? Casey quipped, “Is your boat for sale,” and the owner said “yes,” the first time his wife had heard this news. Long story short, we took a quick look at their boat then and I liked it. For one, we had seen the boat cruising by us in the mooring area. We knew it cruised. The current owners had switched out the stove from electric to propane and had installed a 3-way fridge, which will run off from AC, DC or propane. We like the idea of propane refrigeration, especially if we’re not going to have a boat covered in solar panels. They had done a beautiful job updating the galley. There was SO much storage everywhere. 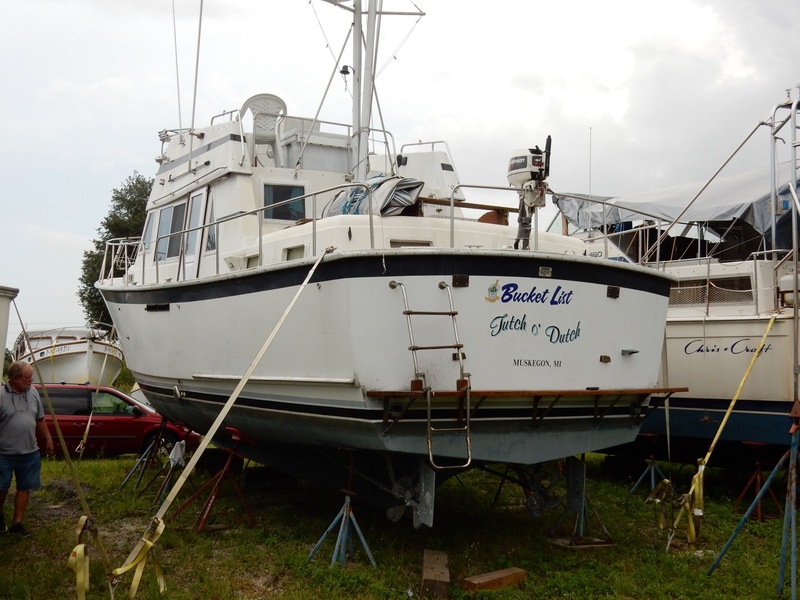 However, there are trade-offs: no “back porch” (cocktails will need to be on the “upper deck” under the bimini), twin engines (twice the trouble/cost/work? ), not the prettiest boat (think “salt pig” sitting on your counter). But it’s functional. And it’s plain. And it’s solid. We looked at a “euro sedan” trawler before leaving for home last March. It was a pretty boat. But the inside was covered with a liner that in my opinion, hid lots of potential problems. And it really was a “couples” boat. We don’t have lots of guests stay with us when we’re south, but it would really be nice to have space for them if friends and family wanted to come spend a few days with us someplace. Well, as of yesterday morning, we own that trawler. She’s a Prairie 36 and currently named, Tutch o’ Dutch with the nickname Bucket List. We will be changing her name. 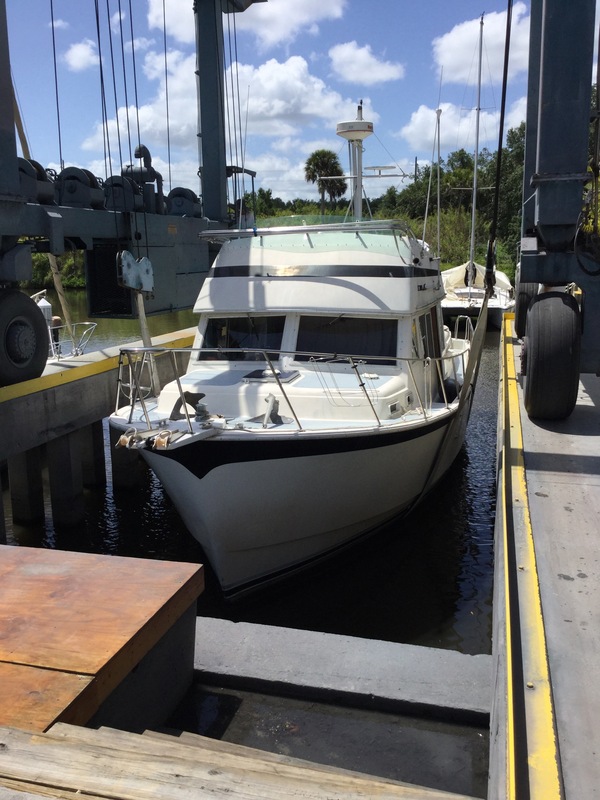 We had planned to leave Indiantown tomorrow morning for a “shakedown cruise” to Charlotte Harbor where we’ll store her for the summer, but we may delay our departure by another day. As sailors, we find that trawlers have SO many more systems to learn and we’re trying to figure this boat out a bit more while we’re tied to a dock and electricity. So much to learn! Congratulations! Shannan and I have talked several times about how if we ever buy another boat, it would be a trawler, for many of the same reasons you gave. Can’t wait to hear more of your new adventures! I know! However, another advantage to this boat is that it does NOT produce much wake. In truth, we’re likely only gaining maybe a knot in boat speed over THW’s engine. So we’ll still be ambling along in the ICW. Last summer we began taking note of trawlers’ wakes so we knew which models to avoid. The Ranger tugs are terrible, btw.